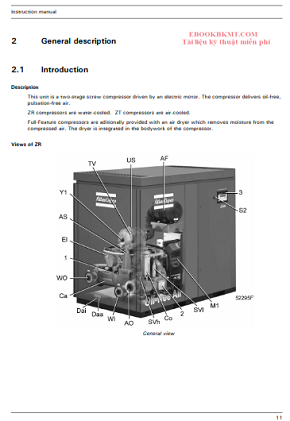 Compressed air system performance. Backed by 100 years at the forefront of compressed air, Atlas Copco products offer the finest quality and efficiency. Our goal is to be First in Mind- First in Choice. That is why Atlas Copco's pursuit of innovation never ceases, driven by the dedication to meet and exceed your demands. Always working with you, we are committed to providing the customized air solution that is the driving force behind your business. ZT/ZR air compressors, designed to meet the needs of people like you. The Maintenance Engineer Oil in compressed air will attack downstream equipment, causing increased maintenance requirements and increased plant downtime. Low cost oil lubricated compressors may look attractive, but when considering the total operating costs compared to Oil Free compressors, the extra investment in a ZT/ZR will easily pay for itself. Breathing oil fumes is definitely not a good idea and oil contami- nates condensate can damage the environment. Why do it the hard way, when you can do it the smart way with ZT/ZR oil free compressors. Guarantee of Oil Free Air. If you require maximum reliability and energy efficiency to improve your total operating costs, the ZT/ZR provides you with the optimum compressed air generation solution.